WorldAlpha is an MMORTS that gives you control over a single unit, or “citizen,” in a virtual world. You will need to keep this unit healthy while advancing him through society, joining a country and choosing a city to live in. Essentially, you will be living a second life within WorldAlpha where politics and economics play a major role in the game. It’s up to you if you want to be a cog in the machine, a savvy businessman, an elite solider, or perhaps even a politician. Unfortunately, there is no visual customization in WorldAlpha. Well, you can upload an avatar but that’s it. The upside is that this is a skill-based game, and you can level-up individual skills to improve their effectiveness. For example, early on I needed to make some money so I started to do mining. Now I have a very decent mining skill and can make my employer a lot of money, which means they want to pay me a lot of money. So you’re free to do whatever you like all the while powering up various skills – be it mining, or writing in a newspaper, or even filling an administrative role in your city. Being a traditional browser-based MMORTS, WorldAlpha doesn’t really have “graphics” so much as a user interface. You won’t be watching units marching off into battle, but instead you will be watching count-down timers. It does have fairly good art, and a functional user interface, but there isn’t much there to keep it from being a fairly static experience. The only downfall that I’ve been able to find to the otherwise solid experience is that when clicking on something, it can often take a maddening amount of time for the page to reload with the updated info. What I mentioned about the user interface is also relevant in this section of the review. The game is “controlled” by the mouse, and that’s it for now. No hotkeys as far as I could find. Usually, this type of control scheme for a browser-based game is OK and I have no problems with it. However, in WorldAlpha, I guess the game isn’t hosted on servers with great internet connections at the moment, as I noticed long load times whenever I clicked on something. On top of that, the game is pretty old school in that no flash or java was used, so the page reloads each time you do something. That, combined with the load times (which honestly aren’t too bad, but are slow enough to be noticeable which is hard to cope with these days), means it can get on your nerves if you aren’t a patient gamer. WorldAlpha is all about community. A large portion of the game, similar to games like EVE Online, is spent not actually playing the game, but making plans and scheming. This means you’re going to be dealing with your fellow citizens, business owners, and politicians frequently. Whether you just want to have a nice chat on IRC, or are making plans for World War III with your fellow leaders of state, you will be interacting with other players often. An example of this is when you take a job; it’s been my experience that you often get a PM from your employer that helps jump-start communication between you two so that he can make the most money off of you, and you can make as much from him. And while not all communication between the community is nice (I’ve seen a few IRC-based arguments since I started playing), it’s mostly kept within the context of the game and is fairly civilized. Veteran players seem to jump at the chance to help newbies out, too. When I first logged onto IRC to chat and learn about the game, I got so much help from a person that I decided to join the country he lived in. Even those that were openly hostile towards certain countries were still friendly towards citizens of that country. I never once had any negative experience with the community during the time I reviewed the game. 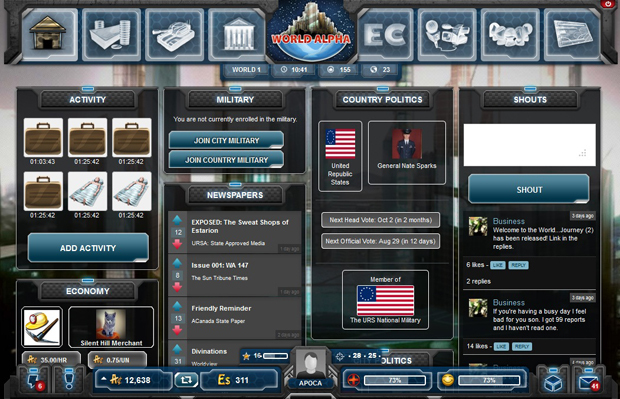 WorldAlpha essentially tries to be a simulation of reality, or as close to one as you can get on a browser-based game. 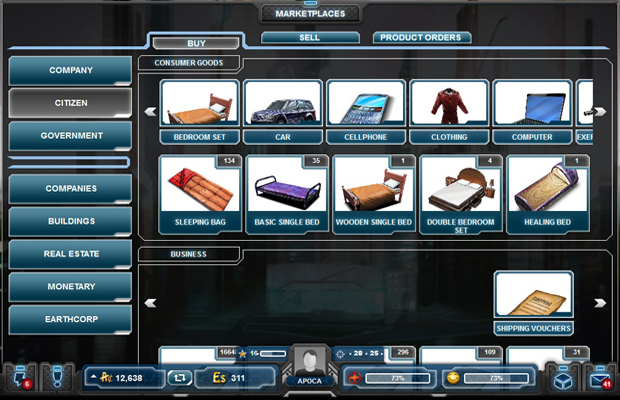 Similar to other games of this type, such as eRepublik, people start their own countries, cities, and businesses. You start out as a lowly worker and build up an income and skills until you can branch out into business ventures, politics, or the military. It’s trying to make your way in this world, advancing yourself as far as you can go, which makes the game fun. There are a lot of options on what you can do, be it produce materials or manufacture items for others to use. When your character is created, you are dumped into the starting country where you will follow a tutorial to learn about the game. You will spend your first days researching the other countries and doing manual labor – mining, farming or manufacturing. After you’ve gotten your starting money, your next goal would be to get into the more advanced sections of the game. As you work, you will begin leveling up skills that can be used to start up your own company, which will (hopefully) get you more money. Starting your own business requires a decent amount of start-up capital, plus the proper permits that will cost you Earth Bucks, which is the cash shop money. 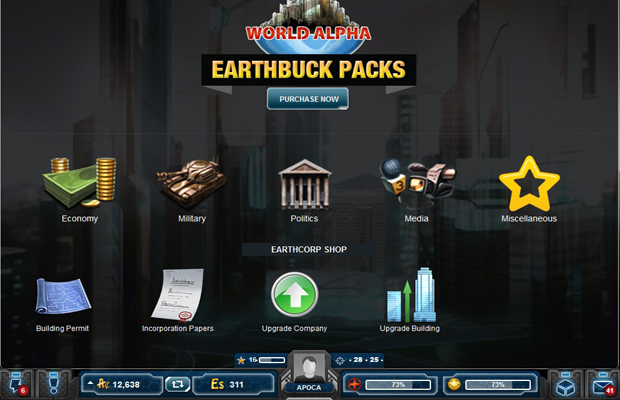 Thankfully, each time you level up a skill, you will get a number of Earth Bucks equal to the new level of the skill. So, if you reach level 9 mining, you will get 9 Earth Bucks. Keep in mind that there are a bunch of skills, and doing an action will often level up more than one. So, the Earth Bucks will pile up fast. For example, within three days of starting, I had enough Earth Bucks to buy a tier 1 incorporation permit. When I say there’s a lot to do in the game, I mean it. There are mines, farms, and factories. Each of these requires that someone work them, someone manage them, someone at some point built them, and the materials required to build them had to be gathered and manufactured by other people. Everything in the game is created by your fellow players. As in real life, you will need entertainment and comfort, so it’s not just food that is made but computers, beds, and even smartphones. If labor isn’t your thing, you can start up a newspaper or TV Station to inform your fellow players on what is happening in the world. Or maybe you’ll just use it to further your political agenda. A lot of people choose to go the route of politician, while others choose to start their own countries (as you can imagine, this is a huge investment). Sometimes they will start with something smaller, though, like a city. 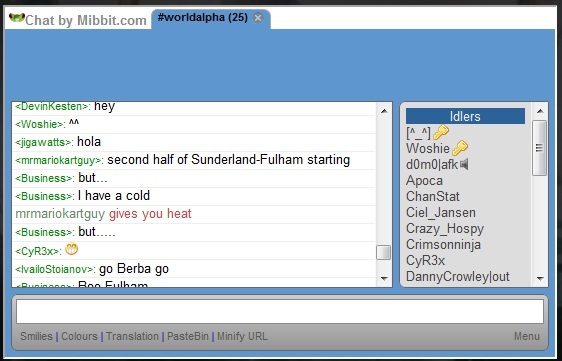 There are a lot of options in WorldAlpha, which is something I appreciate. WorldAlpha does a great job providing players a never-ending list of gameplay options. You can be just another cog in the machine, or you can be the operator of that machine. Unfortunately, the slightly laggy website makes for some frustration. But this is OK, as a large portion of the game actually takes place outside the game – making plans, discussing politics, and interacting with your fellow players. Overall, I had a great deal of fun with WorldAlpha and I will be continuing to play it for a while.